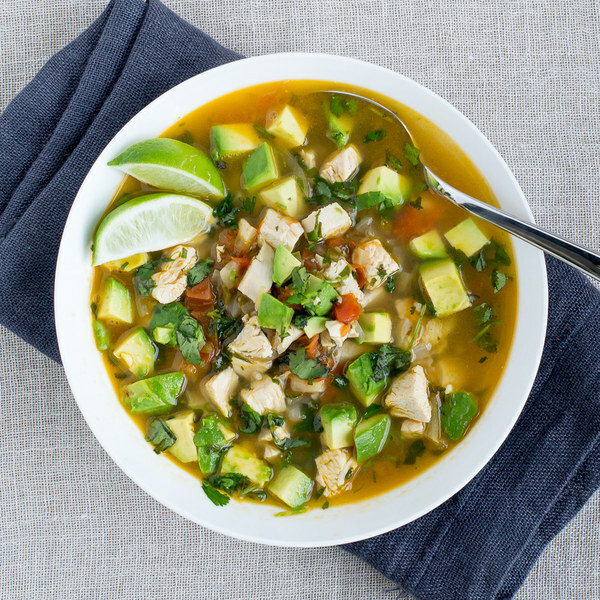 ← Avocado Chicken Soup with Lime & Cilantro. Wash jalapeño and tomatoes. Seed and mince jalapeño. Medium dice tomatoes. Peel and small dice onion. Peel and mince garlic. Add oil to saucepan and swirl to coat bottom. Add onion and jalapeño; cook, stirring frequently, until tender, 2-3 minutes. Add garlic and tomatoes to saucepan; cook for about 1 minute. Slice chicken in half horizontally into thin fillets. Add broth, cumin, salt, and pepper to saucepan. Place chicken in liquid and bring to a boil. Reduce heat back to medium, cover, and cook until chicken is cooked through, 8-10 minutes. Once cooked, transfer chicken to a plate. Wash and dry cilantro. Shave leaves off the stems; discard the stems and chop the leaves. Halve and pit avocado. Spoon out the flesh and medium dice. Shred or dice chicken and return to saucepan. Stir in ¾ of the cilantro (save the rest for garnishing) and lime juice. Cut remaining ½ lime to wedges. Serve soup in a bowl, stir in avocado, and garnish with remaining cilantro and lime wedges.